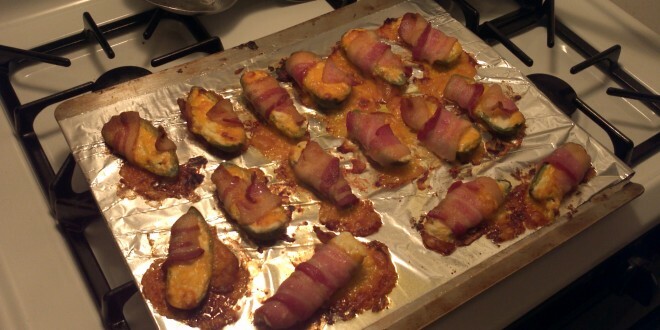 Jalapeno wraps are another great snack to serve at a sporting event or party. The coolness of the stuffing counteracts the hot in the Jalapenos creating the perfect keto snack. Here is the finished product. Some of them came unwrapped during the cooking process. I used half of a piece of bacon, but I would recommend a full piece next time. 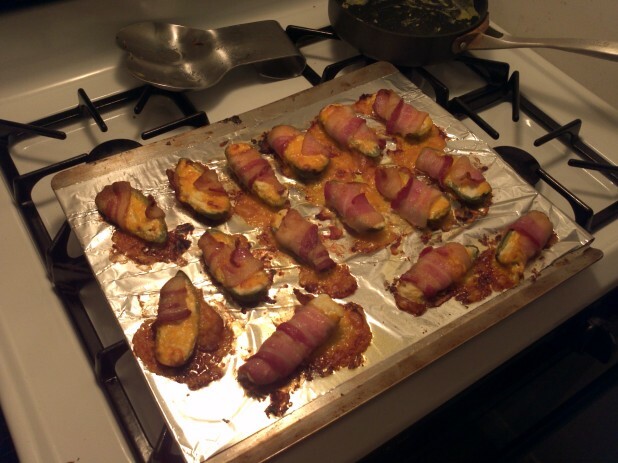 The bottom left Jalapeno is wrapped in a full piece and this seemed to work better. Here are all of the steps. 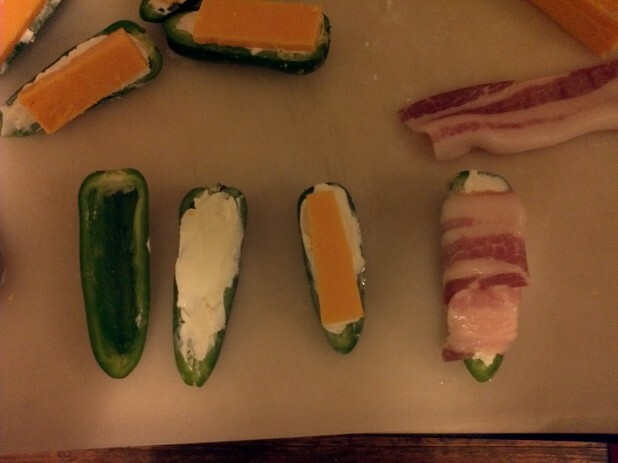 First, cut the Jalapeno in half. Remove the seeds and stems. Next fill the crevice of the Jalapeno with cream cheese. Top it with a chunk of cheddar. Finally, wrap it in bacon. One note, I would wear gloves when making these. The hot juices will not easily come off of your skin and it can be quite painful depending on where you put your hands after this process … If you wear gloves you can also use your fingers to dig out all of the seeds without worrying about any exposed cuts or hot juices. What I do is mix some cooked ground beef/pork inside the cream cheese, adds more fat and protein and tastes delicious! One of my favorite restaurants does something like this, except they also have a shrimp inside of the jalapeno. Another possibility would be to put some chorizo in with the cheese, to really up your pork quantities. This is seriously a staple for me. I eat them nearly every day. Mmm, I love these! I really enjoy using goat cheese as the stuffing.